Emma Stone wore a beautiful column dress in contrasting shades of aubergine and scarlet, belted in with an embellished belt with a suggestive split, which was both regal and alluring. Her hair let the clothes do the talking and a cat-like grey smoky eye emphasised her beautiful blue eyes. We’re definitely going to take inspiration from her look and experiment with a cool silver shade such as Powder Eye Shadow in Soul, deepened in the socket line with Powder Eye Shadow in Gimp, with Liquid Metal in Surge to line the bottom eye lids. 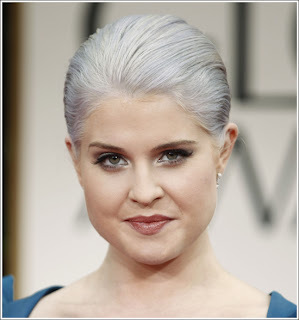 We’ve been inspired by Kelly’s silver toned hair, her look, statement and eye catching, has had us rethinking the dip dye trend of 2011 and favouring a more striking set. We admire Kelly’s dare to be different attitude and her make-up complimented the look with dramatic lashes, deep smouldering eyes and a rose based lip. Our new mascara, ‘Masquara’, lengthens and dramatises the lashes for a similar effect. Here at HQ we love how Mila has rocked this classic, seductive look. Opting for an effortlessly chic floor length black dress and slicked back hair, Mila epitomises the Black Swan look of last year. A neutral palette complimented Mila’s timeless look with a bronzed smoky eye and soft blush lip. To create a similar, flawless finish, we suggest using a hint of Pure Pigment in Breathe on the inner corner of the high to make the eyes pop, Eye Brow Cake in Motto for a natural eye brow and Sheer Lipgloss in Artifice for added pout. What were your favourite looks from the 2012 Golden Globes?